In 2012 my One Word was intentional. I wanted to stop living just to get through another day and start living on purpose. While intentional was my focus word for an entire twelve months, I feel like I am still, two years later, learning what it really means. Because I am always working on and learning about living intentionally, I have been enjoying Casting Crowns song, Made to Thrive. Then I picked up Mark Hall's book Thrive: Digging Deep, Reaching Out . Friends, read this book. I cannot tell you enough how it has blessed me, encouraged me and pushed me along in intentional living. Jesus didn't die so that we could just make it through another day. He died so that we could live and live life fully. He died so that we could be with Him. Have you ever said, if I could just get through today, if I could just make it through this week, or if we can just get through this season? That, my friends, is surviving. I've said it myself time and time again. Even two years after working on intentional living. I am tired of surviving. I am tired of barely making it through. It's time to thrive! 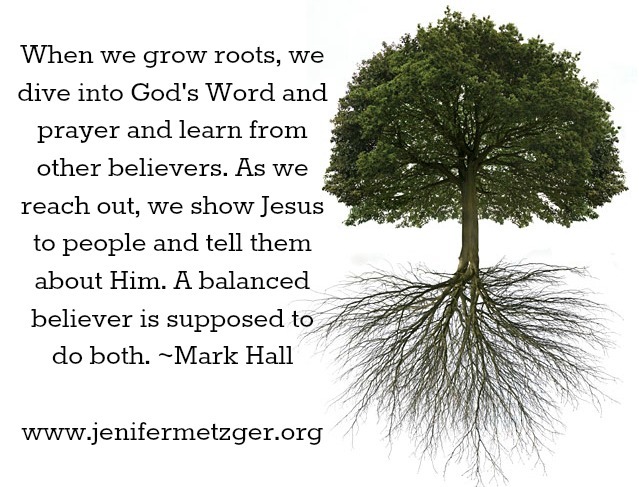 Dig Deep into the roots of our relationship with Jesus. This helps us understand who God is and we are are in Him. We dig in to know God. Instead of just reading my Bible in the morning to check it off the list of to-dos, I need to dig deep. Read, study, pray over it, talk to God and talk with other believers. I need to deepen the relationship I have with the Father. At the same time I need to reach out to others and make God known. I am an introvert to the max. I am perfectly happy and content with my small circle of people, but God places people in our paths for a reason and I need to reach out to them and make God known. A tree's roots help it to get the water it needs to thrive, a plant thrives when it is watered and Jesus is our living water. We must dig into Him and drink His living water. We can do that by chasing after God. When a believer chases after God's heart, God makes sure the believer catches it (Mark Hall). Are you reading to stop surviving and thrive? I would encourage you to pick up a copy of Thrive: Digging Deep, Reaching Out . You will be blessed!